Martin Solomon, a principal officer with P&S Equities, is a long-standing corporate benefactor to YSU. Martin and Susan Solomon also have donated two prominent works of art – a painting and an outdoor sculpture – to the YSU College of Creative Arts and Communication. “This generous gift is yet another indication of the Solomons’ devotion to the arts and to our college. 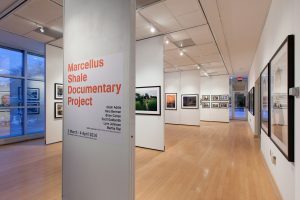 This gallery has become an important exhibition space for the university, as well as the community. This donation ensures our continuing ability to provide a professional gallery experience in Bliss Hall.” The gift will be used for physical improvements to the gallery. The gift also will establish an endowment for programming for the CCAC, as well as maintenance related to the gallery. Judith Rae Solomon, a native of Youngstown, is a prominent architect, art enthusiast and a member of the advisory board for YSU’s McDonough Museum of Art. Check on the Department of Art’s website for reception information, closer to the exhibitions. Fixed opening nights for Theater – Dates TBD – gallery will also be open these nights.